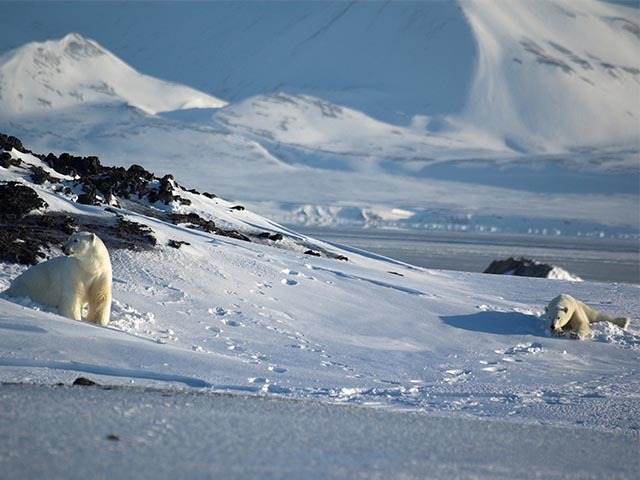 Explore North Spitsbergen in search of polar bears on this 8-day tour on board the m/v Plancius. Enjoy the midnight sun, see stunning landscapes, and spot minke and beluga whales, ivory gulls, walruses, ringed and bearded seals, and more remarkable wildlife! Enjoy the midnight sun (24 hours of daylight) and begin your Arctic Adventure tour by sailing out of Isfjorden on board the m/v Plancius. Look for minke whales and sea birds as you sail out. Your Arctic voyage begins upon arrival at Longyearbyen. Your home for the next few days, the m/v Plancius is anchored here, waiting for you to embark on a journey of a lifetime. However, before boarding the ship, take some time to explore Longyearbyen, the administrative capital of the Spitsbergen archipelago. Stroll around this mining town and visit its parish church and Polar Museum. Board the m/v Plancius and sail out of Isfjorden early in the evening. The vessel accommodates 114 passengers in 53 passenger cabins with en suite facilities. There is a restaurant/lecture room on deck 3 and a spacious observation lounge (with bar) on deck 5 with large windows, offering a full panoramic view. It also has spacious open decks from where you can look for your first sighting of minke whales as you leave Isfjorden. Spitsbergen is an Arctic archipelago about 650 kilometres north of Norway. The archipelago ranges from Bear Island (74 degree N) to Rossøya (81 degree N). It is by far the largest wilderness area of Europe. About 60% of the land is glaciated. As Spitsbergen lies far within the Arctic Circle, it experiences the midnight sun from April to August. At this time of year the sun is above the horizon for 24 hours a day! Since 1925, Norway has sovereignty over Spitsbergen according to the international Spitsbergen Treaty. The Norwegian name for the archipelago is Svalbard. The name Spitsbergen was given by the Dutch explorer Willem Barentsz. The meaning of the name Spitsbergen in the Dutch language is "Jagged Peaks" because of the sharp pointed mountains that Barentsz met in the northwest of Spitsbergen. Spitsbergen, which has a population of about 3000 in 4 settlements, is to this day virtually an unspoilt wilderness. Explore Raudfjord or Liefdefjord. Besides enjoying the beautiful landscape, spot polar bears, ringed and bearded seals, kittiwakes, minke whales, and belugas. Depending on the sailing conditions, you visit Raudfjord or Liefdefjord, beautiful fjords dominated by spectacular glaciers and favoured by ringed and bearded seal. You can also look for your first polar bear sighting here. Liefdefjord has a remarkable red colour due to red sedimentary sandstones. Look for kittiwake colonies, minke whales, and belugas here. The cliffs and shoreline of Raudfjord support thriving seabird colonies and surprisingly rich vegetation, which flourishes in sheltered spots. 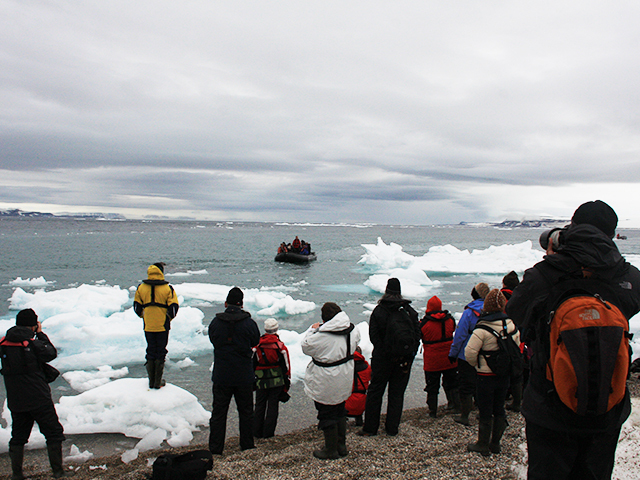 Continue to explore the Arctic’s varied landscape and spot walruses, Sabine’s gulls, ivory gulls, and polar bears. Start the day by exploring Laagøya, a low island with a big lagoon where a big herd of walruses tends to congregate. Sabine’s gulls also nest on this island. You cruise in zodiacs (small boats) and make a landing here to explore the wildlife up close. Later you sail through Beverleysundet named by explorer Parry in 1827 and also sailed by the Swedish-Russian Arc-of-Meridian Expedition in 1898. On the same day or the next, push east to reach the area of Nordaustlandet, where the Nobile expedition drifted around in 1928. Polar bears inhabit this region, along with ivory gulls. Here, if weather permits, you visit Alpinøya, and then the mouth of Finn Malmgrenfjord, and Albertinibukta bay. Climb Soraberget (205m) hill from where you will have a fantastic view of the icecap of Nordaustlandet. Alternatively, you will land at Storøya, where again you may meet a group of walrus. Reach the northern-most point of your voyage today at 81 degrees north. Spot polar bears, elusive Ross gulls, and ivory gulls. Reach the northernmost islands of Svalbard: the Seven Islands north of Nordaustlandet. You will attempt to land at Phippsøya where you can walk near walrus hauled out on land. Your guides will then try to find the best places to take in the spectacular surroundings and look for polar bears, elusive Ross gulls, and ivory gulls. You will now be at 81 degrees north, just 870 kilometres from the geographic North Pole! The ship will now sail westwards. See polar bears, whales, and large seabird colonies. After visiting the northern most point of your journey the previous day, you now retrace your voyage to the west. 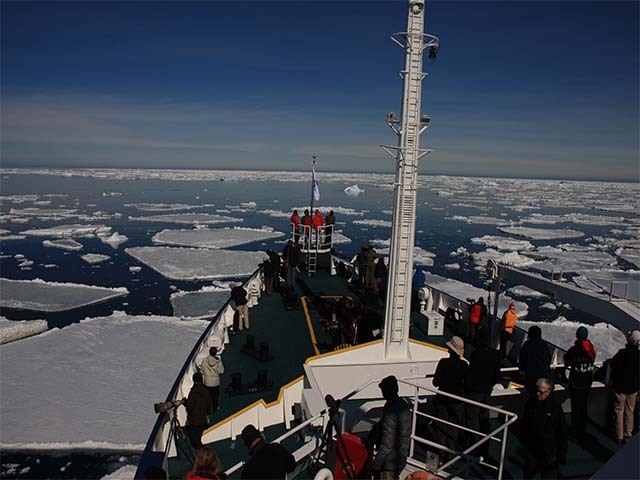 Sail through and along the pack-ice north of Spitsbergen. 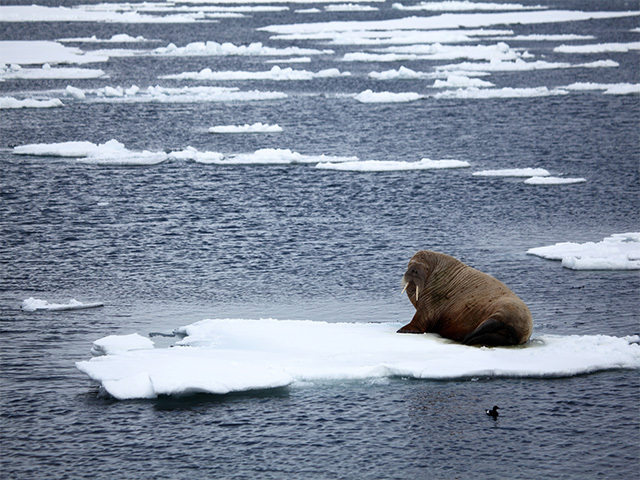 Be on the look out for polar bears and northwest of Spitsbergen, look for whales. Your guides will constantly help you spot the magnificent wildlife of this area that includes large seabird colonies. You will also embark on zodiac cruises or perhaps even shore excursions where possible. Spitsbergen is a breeding ground for large numbers of seabirds that feed in the food rich Arctic waters. Brunnich's and black guillemot, Northern fulmar, and kittiwake prefer the steep ledges in order to stay out of reach of predators such as Arctic foxes. Arctic tern, ringed plover, purple sandpiper, and four species of skua stay down on the tundra where they depend on their camouflage or aggressive behaviour. After seven days of exploring the stunning Arctic Circle, your voyage ends today as the ship returns to Longyearbyen.